I grew up in Detroit, in an environment where one was supposed to be Democrat and where people constantly told me that Republicans were evil and racist people. As I entered my teenage years, I did not have the exposure to the political world that is more easily afforded young people via technology today. I did not develop my own train of thought regarding political parties and what politicians could help accomplish for myself, my family and my community. The first presidential election in which I could vote was in 1972, which saw George McGovern face off against Richard Nixon. As a student of Yale University, I found it comforting to follow my classmates and vote Democrat. While McGovern fell dramatically to Nixon, I still identified with Democrats and voted for Jimmy Carter in 1976 as he battled Gerald Ford. I decided to vote for Carter again in 1980, as he seemed like a decent person. However, he would lose in a landslide to Ronald Reagan. During Reagan's first term, I had just begun my neurosurgery residency at the Johns Hopkins Hospital in Baltimore. I had exposure to many patients with unfulfilled lives because they were becoming dependent on government programs, and it struck me as the wrong way to go. Almost all of my patients were on some kind of medical assistance and social welfare programs, and their lives were in shambles. Simultaneously, I listened to President Reagan's speeches and he did not seem evil and racist, as portrayed by the Democrats. In fact, I viewed him as a decent, trustworthy man who was a true leader. Thus, in 1984, I voted for Reagan. This was a pivotal moment in my life, as I allowed myself to make a decision based on who the candidate was and his capabilities. This was contrary to voting based solely on party affiliation, which I had been conditioned to do my entire young adulthood. Fast forward to 1988 and 1992. I voted for George H.W. Bush, who seemed very pro-American and preached the importance of caring for everyone. My ways of voting Republican continued in 1996 because of Bob Dole's strong military and war record (U.S. Army second lieutenant during World War II), a man who appeared compassionate, was a strong leader, and who thrived as Senate majority leader for eight years. Although Dole did not win, I still believed strongly in my conservative values and realized that the more you build in your life and in your career, and the more you raise children, the more conservative and the less liberal you become. When George W. Bush campaigned in 2000, his policies and general philosophy appeared more in line with my beliefs. The same held true in 2004, and I was intent on him seeing through what he had started in Iraq and other parts of the world. The country had been exposed to dangerous forces that threatened our way of life, and President Bush was adamant about protecting our nation. 2008 was monumental for the United States, with Barack Obama becoming the first African-American with a legitimate chance of winning the presidency. I was torn by history, being an African-American myself and understanding the tribulations that my race had endured over time. Nevertheless, I understood that Obama did not represent me as an American. Instead, Senator John McCain's principles and military experience earned him my vote. The financial crisis that devastated our economy would prove to be an important factor in the next election, and I believed we needed someone with sound business acumen and an ability to lead the nation towards prosperity. With the risk of a growing national debt and frivolous spending, it was clear to me that the man I voted for, Mitt Romney, would be a more able candidate in uplifting the economy. Voting is critical to holding our elected officials accountable for their actions and inactions. Continue to exercise that amazing privilege and vote the leadership that is necessary to move our great nation forward. 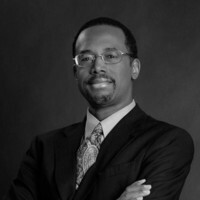 Ben S. Carson is professor emeritus of neurosurgery at Johns Hopkins University and author of the new book "One Nation: What We Can All Do To Save America's Future" (Sentinel). To find out more about Ben Carson and to read features by other Creators Syndicate writers and cartoonists, visit www.creators.com.